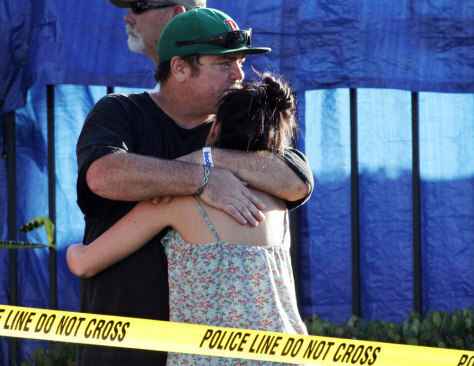 >>> we begin with the deadly shooting rampage at a salon in seal beach , california. nbc's kristen dahlgren has the latest on this story. good morning. >> reporter: good morning, ann . this morning we are hearing stories about people running and hiding from the gunman inside the salon . police are releasing more information this morning about that alleged gunman and while they haven't released names of the eight victims killed, many in this close knit beach town knew him personally. outside the upscale salon a small community , shaken to its core. >> i think i've lost some friends in there, three of them, i think. >> reporter: cell phone video cap churpd ttured the panicked moments just moments after the bloody massacre as victims were wheeled out. for most victims though there was nothing rescue crews could do. >> when the woman came by, i know she was in the salon , it looked like she had gotten her hair colored red. i'm assuming that was blood. >> reporter: it was the middle of the day in the crowded salon when authorities say the gunman, in full body armor , carrying multiple weapons, opened fire. >> the only thing i saw was the police arriving and fire crews arriving and that's when we knew it was serious and to go back inside. >> reporter: police describe bodies scattered throughout the salon and another victim was found outside. >> there were nine reported injured, six of whom were deceased inside of the salon . three were transported to a local hospital. of those three, two of those three have seccumbed to their injuries at the hospital. >> on the way back to his car, he saw the gentleman who witnessed it so he shot him through the side window. >> police say a white truck seen leaving the scene led them to a suspect a half mile away. home video shows the suspect surrendering. police say they found multiple weapons in the truck. neighbors who recognized him are in shock. >> i looked online and i said, i know that guy and i looked at the truck and i said i know the truck. and my husband said, no that's not him. he said, he's talked to the man many times and he was saying how loving he is. >> reporter: overnight police identified the suspect as 42-year-old scott dekrai. workers and friends of the salon owner said his ex-wife was a stylist there. >> in the past i knew there was a lot of strife between the two of them. >> he has a little boy so now the little boy is without a mom or a dad. >> reporter: so many in this small town now without someone left trying to understand how the unthinkable could happen here. >> seal beach is a small, safe community . we don't experience these things ever. >> reporter: now, there was one female shooting victim still in critical condition . as for those killed there were six women and two men including the salon 's owner. in a statement this morning his family said they are still trying to understand their overwhelming loss, ann . >> nbc's kristen dahlgren, no kidding. understandable. thank you so much. for the latest on the investigation we're now joined by sergeant steve bowles of the seal beach police department . sergeant bowles , good morning. >> good morning, ann . >> your department has released the name of the suspect as we just heard scott evans dekrei and also a photograph. what can you tell us? we understand he is 42 years old. >> that is correct. he's a resident of huntington beach a city just south of seal beach . >> what more can you tell us about who he is and how long he has been in the community ? >> unfortunately i don't have all of that information at this point. the case is still under investigation. our detectives are still out at this hour of actually the late night/ early morning still continuing their investigation and interviewing witnesses. so i don't have any of that information at this time. >> can you confirm the report we just aired that friends and co-workers of the salon owner say the gunman was the ex-husband of a stylist who worked at the salon ? >> you know, i can't confirm any relationships right now. as the investigation is unfolding that is being determined based on interviews. we also don't truly understand the motive for the shooting at this point. because there were so many victims inside the salon we're just still unclear as to exactly what his motivation was. >> there were so many victims. about the woman who has been wounded and is still alive can you tell us the status of her condition? >> she is in critical condition . she seems to be doing better and we're definitely hoping for a recovery for her but she is in critical condition at one of our local hospitals. >> it's amazing so quickly after this shooting how many people have come forward to say that they remember this man as being such a good man, a nice man. there are some reports that they remember him being fit and endearing, would fish at the local water front and work the port docks. what can you tell us about what he might have said when he was arrested? >> you know, at the time he was seen leaving the area in a vehicle and the seal beach police officer stopped his car, ordered him out of the vehicle, and he was compliant and did not resist and did not provide any problems for our officers. he was taken into custody without incident. for our community in seal beach , this is absolutely one of the greatest tragedies that's ever happened here if not the greatest. and, you know, he does have friends it appears in our community . he has family in our community and our community certainly is reeling from the loss. >> meantime, we've been hearing this report from ap's reporting that dekraai and his ex-wife are battling for custody of their son who is i understand about 7 or 8 years old. do you know that boy, that son is in safe hands this morning? have you been monitoring that? >> i can tell you that without a doubt that all the children involved either of the victims or our suspect are being properly cared for this evening. again, i can't comment as to his motivation or relationship at this time based on trying to preserve the integrity of the case as it is currently unfolding. >> and obviously this is still in development and you certainly have been working very hard. sergeant steve bowles , thank you so much for taking a moment and talking to us this morning. People gather near the scene of a deadly shooting at Salon Meritage in Seal Beach, Cali on Wednesday.